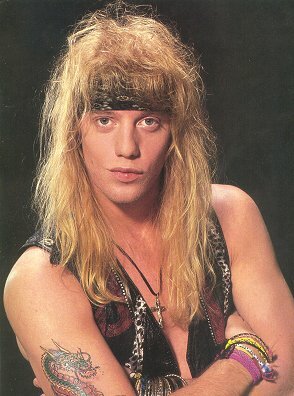 As I’m sure any 80s Metal fan has heard – Warrant lead singer Jani Lane was found dead last week. He narrowly missed the Forever 27 Club by a mere 20 years, but his voice will live on forever in Metal fans’ heads and endless cherry pie recipe’s. I’ve already made mention of this band in a previous post as I grew up rocking out with them (well, not all the time) and singing Cherry Pie in my head every time I saw a blond girl around school that I wanted to . . . get to know better. At a time when pies faced brutal persecution among America’s youth concerning the measure of standards among top desserts, Jani and the gang (along with the help of model, Bobbie Brown – no relation to New Edition) reintroduced its luster back into teenagers’ mainstream thoughts. So let me dedicate my Music Video Monday selection to the man with the girlie first name and the manly pie agenda. I’m sure this video is currently (within the past week) been playing on a slew of blogs but we haven’t posted it yet, so here it goes . . . I like pumpkin and pecan. How does that relate?